I received a Kindle last year for Mother’s Day, and I am so loving it. As a writer it is imperative that I read—a lot. I love to buy books. I use the library, too, but I want the book when I want it. Buying books can become an expensive habit. I have found my Kindle so economical. Since receiving it I have spent less than $40 on books all year. Yet, I have downloaded almost 100 books. Want to know my secret? First I look at the free e-book downloads offered on Amazon. Those change weekly. There are all your classics: Charles Dickens, Jane Austin, Arthur Conan Doyle, and more. Each week there are books by well-known and new authors to choose from. Click the buy button, and they download instantly. Rather than mindlessly downloading every free book, I read the descriptions and some of the reviews. I have found new favorite authors that way. Unfortunately, I have also found some badly written novels or some that weren’t my cup of tea. Hey, they are free, and I can simply delete them. Second, I friend lots of writers on Facebook. They post when theirs or other authors books are free to download. The trick is to not wait. Often it’s only available for a day or two. This is a marketing strategy for them. Some authors offer a previously published book to attract our attention to purchase the sequel. Sometimes it’s their latest. I download the book and pass on the info to my friends. Because they are so gracious to make them available I often post book reviews. That in turn generates sales for the author. Many libraries allow you to borrow e-books, and you can now lend a book to a friend’s Kindle or kindle app. The only catch is you must read it in two weeks before it disappears from your device. I still adore the feel of a book in my hand. I love being able to go back to the very page that inspired me. This is my preference for books on writing. My shelves are filled with highlighted tomes of helpful information. You can highlight as you read your Kindle (I haven’t figured that out yet.) and save those clips to download to your computer. Not quite ready to embrace that application. I am resisting it like I did Facebook and LinkedIn a few years ago. Nook and other e-book applications offer free books, as well. This is a good way to test drive a book before you purchase. Hooked: write fiction that grabs readers at page one and never lets them go by Les Edgerton had so much to offer that I ordered several copies to give my writers group. What has your experience been with e-book technology? My hubby and I went to see The Avengers. We have been following all the previous movies the past few years, waiting for this one. 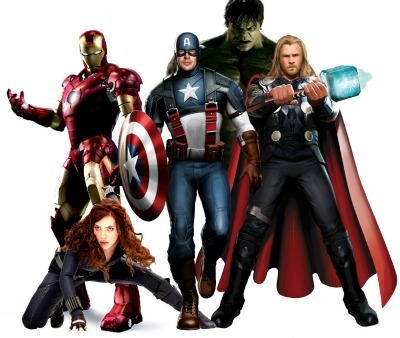 From a writer’s view point the movie The Avengers illustrates series books. The original movie Ironman sets the scene for the heroes to follow. The Hulk gave us glimpses of Captain American frozen in ice and the introduction of General Fury. Ironman II had one of Captain America’s shield subtly displayed in his laboratory, introduced the Black Widow and had Thor’s hammer at the end.. Thor introduces the possibility of aliens as well as a brief appearance of Hawkeye. Captain America reveals the power source that is the basis for Ironman’s power and the chemical that Dr Banner was trying to recreate. The dangers of both the super-soldier chemical and the alien power source are clearly defined. By the time The Avengers come to the big screen, we are familiar with all our characters’ back stories and the essential ingredients of our plot. This allows the plot to drive the movie rather than the characters. We get the jokes because we know our superhero’s personalities. Our heart’s race as we anticipate how each may respond as the action progresses. Novels in a series have the same building blocks. The first book gives us a feel for place and builds community. The secondary characters have just enough depth to build them into main characters in later installments. Main characters in previous books become secondary characters in later books as we continue to explore the world the author has created. We want our readers to continue to come back just like movie goers did for The Avengers. The viewers have embraced the characters, anxious to see what their beloved heroes will accomplish as a team. Waiting spellbound until the end. All the pre Avenger movies had additional scenes at the end after the credits. We sat in the theater waiting to see what the teaser would be. likewise, a wise author will add a scene from the sequel at the end of the story to entice the reader to go on to the next book. What do you see as the key to creating a good book series?